With this light rake, mixing compost or peat with soil is easy and efficient. Also when clearing foliage, harvest waste, etc. 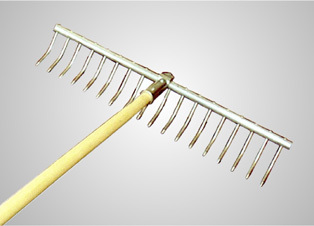 from gardens and beds, the light curved teeth make this rake a welcome help. The angle of the teeth can be easily adjusted at the handle joint, according to the work to be done.